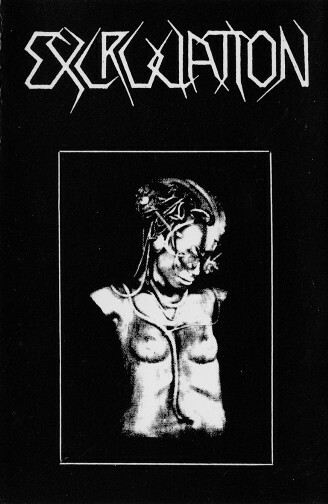 Recorded at DNS-Studios, Birmensdorf (Switzerland), March/April, 1988. Edition of 1500, 1400 regular, 100 promos. 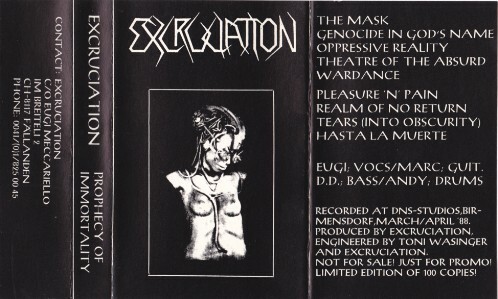 Notes: This MC was to be released as EXCRUCIATION's first full-length album. Unfortunately their record-company CHAINSAW MURDER RECORDS stopped producing. We Bite Record wanted to take over, but due some problems with them (mostly financial issues) we refused. A few record labels were interested, but well, being still teenagers wanting to conquer the world, none of the offers were good enough. It was later released only as MC. Apparently a vinyl bootleg exists released in Colombia or Brasil. Never seen it, but being told to us during an interview with a colombian radio-station. Optioned by F.O.A.D. Records to release it as LP ror CD. Promo, limited to 100 copies.